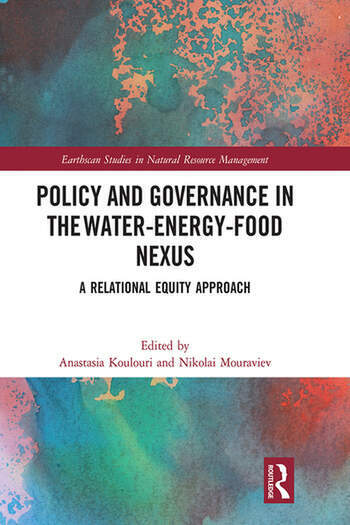 This book discusses the balance of priorities within the Water-Energy-Food (WEF) nexus and its impact on policy development and implementation, highlighting innovative perspectives in adopting a holistic approach to identify, analyse and manage the nexus component interdependencies. Due to increasing demands for natural resources, the WEF nexus has emerged as a response to the numerous global challenges. Addressing WEF challenges often involves balancing multiple and competing priorities and identifying and managing interrelations, synergies and trade-offs between the three components of the nexus. In this volume the authors focus on the dynamics between multiple stakeholders, such as governments, businesses, NGOs and local communities, when addressing WEF challenges by adopting a nexus approach. The book argues that effective engagement of multiple stakeholders can address difficulties arising from the introduction of an integrated approach to WEF policy design and implementation, increasing the potential benefits. The book also looks at the effect of international relations and regional power struggles on resolving cross-border WEF nexus issues. Case studies are drawn from Kenya, Central Asia, USA and Peru, highlighting key themes, such as how collaborative governance, enabled and facilitated by relational equity management, can be viewed as an innovative way to reconcile competing priorities. The combination of theoretical and case study chapters makes the book of interest to a wide audience, including scholars and advanced students of sustainable development, agriculture and food studies, water and energy policy design and governance, as well as to practitioners working in the fields of water, energy and food security. 8. Using Oilfield Produced Water in Agricultural Crop Irrigation —An Opportunity for Integrative Water Management for Food and Energy Production? Anastasia Koulouri graduated from the University of Strathclyde, UK with a PhD in Management Science. Previously she has held posts at the University of Strathclyde, UK, the Technical University of Helsinki, Finland and the Belgian Nuclear Energy Research Centre, Belgium. Currently she is a Lecturer at the School of Business, Law and Social Sciences, Abertay University, UK. Nikolai Mouraviev is a Senior Lecturer at the School of Business, Law and Social Sciences, Abertay University, UK. Previously he has held teaching positions at KIMEP University, Kazakhstan, Wayne State University, USA and Viterbo University, USA.